Entries for the Competition will open at 6h00 on Thursday, 12 July 2018 and will close at 11h00 on Thursday, 19 July 2018 (Competition Period). 1.1. The Expresso DIP N OUMA & COSY UP Competition (Competition) will be run by Cardova Trading (Pty) Ltd in association with RCL Group Limited (Organisers/we/us/our). 5.2. We will notify the Winner by commenting on the Winner’s entry post within 6 (six) hours from determination of the Winner to request a copy of the Winner’s identification document in order to validate his/her entry and to request further contact details. 5.3. The Winner will be required to provide an electronic copy of his/her identification document within 3 (three) days from being requested by us, failing which the Winner will forfeit the Prize and have no claim against us. 5.4. If a Winner does not reply to the notification message sent by us within 6 (six) hours from it being sent by us, that Winner will forfeit the Prize and will have no claim against us. In the event of a forfeiture as contemplated herein, we shall have the right to select a different entrant on the same conditions, except that we will only be required to make 1 (one) attempt to contact each further Winner drawn. 5.5. The Winner may be announced on Expresso and its digital media sites. 6.1. 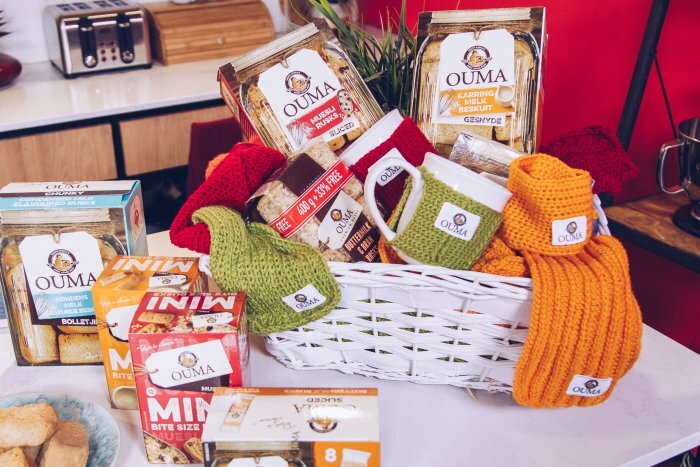 The Winner will receive an Ouma Rusks hamper to the approximate value of R500.00 (five-hundred rand) (Prize) that includes various Ouma Rusks and Ouma Rusks merchandise. 6.3. We will contact the Winner to receive all necessary information to deliver the Prize and the Prize shall be delivered to the Winner at an address within the Republic of South Africa within 6 (six) weeks from confirmation of the Winner. 7.3. We reserve the right to amend these terms and conditions and Competition rules during the Competition Period if deemed necessary at our sole discretion.